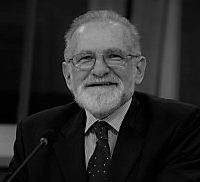 Bronisław Geremek (1932 – 2008) was a Polish historian and politician. He was an outspoken supporter of government reform in the 1980s, a prominent adviser to future President Lech Wałęsa (then leader of the Solidarity movement), and a key negotiator for the free national elections of 1989. Later (1989 – 2001), Geremek served as a representative in Poland’s parliament, as Poland’s foreign minister (1997 – 2000), and as a member of the European Parliament (2004 – 08). He studied at the University of Warsaw and in Paris, where he remained to teach French medieval history at the Sorbonne (1962 – 65) and the College of France (1992 – 93). Profesor Bronisław Geremek był dla Europy niczym ojciec. Swój sen o wolnej Polsce wniósł do na nowo zjednoczonej Europy przez stocznię w Gdańsku, polski Sejm oraz urząd ministra spraw zagranicznych. Professeur Bronisław Geremek était un père fondateur de l’Europe.